Putting up a bird feeding station is a good way to attract native birds to your garden. Sugar-water feeders will attract nectar-feeders like the beautiful tui and cute silvereyes/waxeyes. On the Russell Peninsula we have kiwi living amongst us. This is special! You can help to protect the kiwi in your backyard by putting out a kiwi nesting box. A nest box deters predators and gives vulnerable eggs and chicks extra protection from the weather. 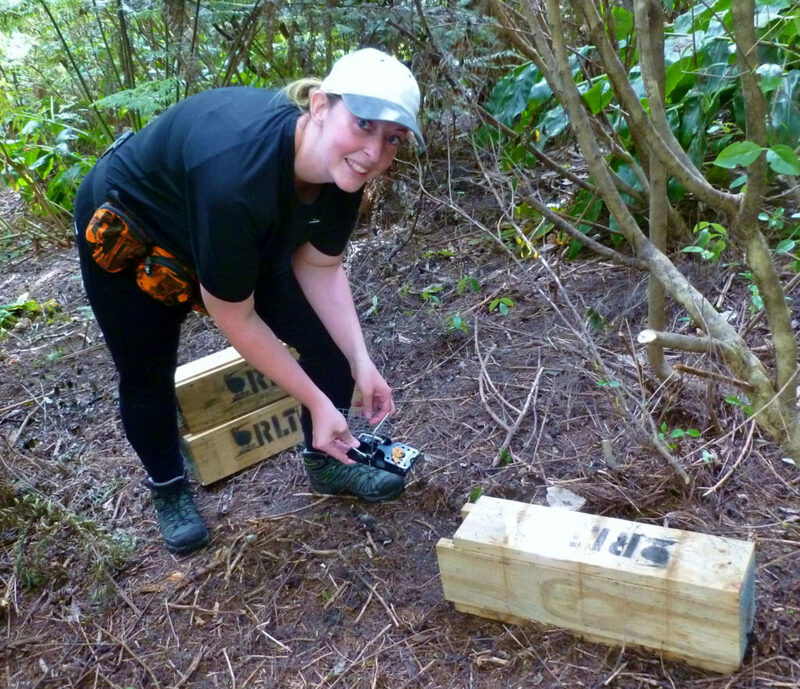 The box in this photo helped bring 3 kiwi chicks into the world in just one year. The larger female kiwi is on the right and the male is one the left. We are very lucky on the Russell Peninsula to have a kiwi population which is well established. Very few towns in New Zealand still have kiwi so close. But kiwi living here are still at risk. Nationally 95% of kiwi chicks are killed in their first year and far too often in Northland adult kiwi are killed by dogs. So let’s be proactive and help kiwi to continue to live amongst us. Before humans arrived in New Zealand there were no ground-dwelling mammals – it was the land of birds. That changed when people arrived with rats, cats, dogs, stoats, possums etc. Our native forests and wildlife have no defences against these recent arrivals so it is essential to control introduced predators and protect native ecosystems. Pest control keeps forests and wetlands as functioning habitats and enables native birds, insects and lizards to breed and thrive. Russell Kiwi Protection maintains its own predator control network and we encourage and support landowners to do predator control on their properties. We can provide you with the advice you need to get started and make a difference or we can organise a program for you. If you listen carefully you can hear kiwi calling most nights, even in town. This is special! By supporting “Russell Kiwi Protection” you can help kiwi thrive and increase the chance of a kiwi nesting in your backyard. With support from our community, visitors who come to this wonderful place and anybody who cares about kiwi, we can double the kiwi population on the Russell Peninsula. Your donation will make difference! MAKE A DONATION to enable us to do the work. Don’t forget, your donation is tax deductible. ONLINE BANKING directly to our account. This is our preferred method as it means every one of your dollars reaches us. Please put “Kiwi donation” in the particulars field and your name as the reference. Then send us an email at russelllandcaretrust@gmail.com or a letter so we can send you your tax-deductible receipt. Include your name and address so we can send you a receipt. If you’d like us to do predator control on your land or help you set up your own programme call the Project Co-ordinator, Eion Harwood on 021 173 1130. Why not get together with your neighbours to cover your street or area?